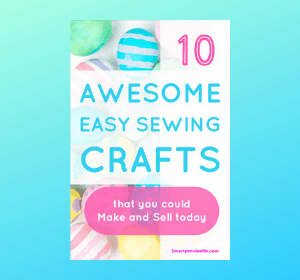 Are you Crafty? 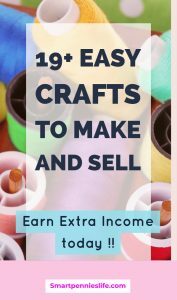 Do you want to make extra income selling your favorite crafts that you can make in your spare time? 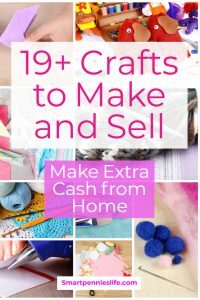 How about some inspiration 19+ crafts you can make and sell today. 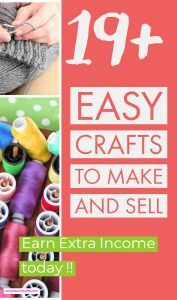 Wondering where you can sell your crafts? 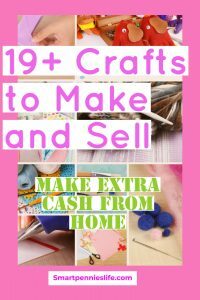 There a lot of options and I will cover this in another post to help you decide where you are going to sell your crafts once you make them. 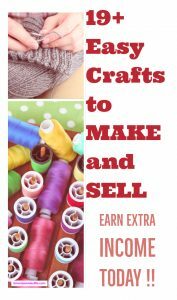 One of the best ways to sell your crafts is using your own website. If you want to start your own website then grab my free guide. How to start your Blog a complete guide for Beginners covering how to set up your blog, themes, hosting and Google Analytics. 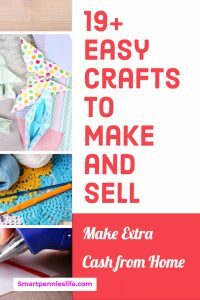 There are lots of great crafts you can make and sell in your spare time. Make sure what you pick to do won’t cost too much and won’t take too much time. Here is a fabulous selection to get you started making money today. There are a few options with making soap you can make cold processed soap which involves using Oils combined with Lye ( sodium hydroxide and water), buy a soap base and melt it add scents and remold, or use Melt and pour soap. Essential Depot is the place to go. Looking for recipe inspiration then try one of my fav resources then look at soapqueen.com. Melt and pour soap you can purchase this from various places for instance here is a round up of some of the best Melt and pour soap bases on Amazon. I love this idea crafting Candles in old fashion teacups that you can buy in thrift stores they are gorgeous. 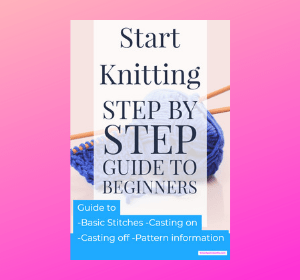 Here is a really straightforward tutorial from Craftingagreenworld to get you started. 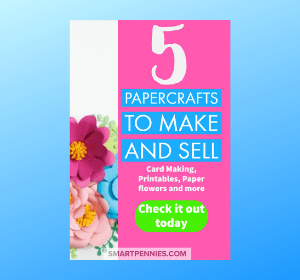 You can do so many things with Printables here is a selection of different options to help get you started. This is some of the quickest and simplest things you can sell and make from simple beaded bracelets to more complicated wire wrapping. 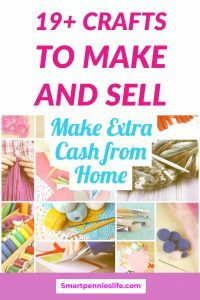 This is super easy and quick to make and you can churn out lots in one go. One of my favorite tutorials is from Onelittleproject you can find it here. Coolcrafts has lots of ideas on how to paint clay pots see this post. Favecrafts also has tonnes of ideas for Painted pots. Makingmanzanita has a great tutorial on how to paint mason jars. If you have tonnes of Mason jars hanging around what about giving them a lick of paint. You can purchase second-hand mirrors at yard sales or thrift stores and upcycle them here are tonnes of ideas to get you started from manomano. And more ideas for bigger mirrors. Here are some ideas to get you started with making little succulents. 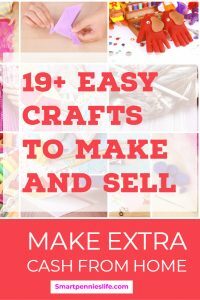 There are tonnes of ways to make Bookmarks here are 50+ ideas to make bookmarks to make and sell. 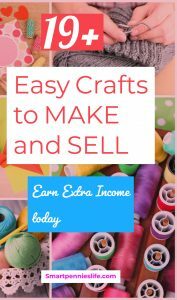 Bath bombs are super easy to make and you can use absolutely anything for molds it’s easy to get started check out this post. Here is the post to make Chalkboards. What about making wrapped pencils easy to do and cheap to make and they can be so pretty! How about making coasters from Ceramic tiles. Here is a great tutorial for you to try. How to make coasters from yarn or material. If you are good at sewing how about a pattern for a phone charging station. How about making a coffee cup sleeve? There are tonnes of ways you can make them. 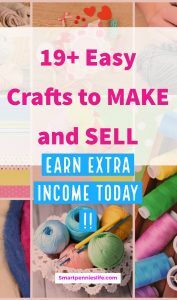 I hope that gave you lots of inspiration to start making your own Craft items today to sell in your spare time. NextWhere should you sell your Handmade Items : local or online?